The 2007 and 2009 amendments to the Zoning Resolution made significant changes to the design, amenities, and operational standards for privately owned public space. The amendments introduced a new type of POPS, the public plaza, which replaced provisions for urban and residential plazas. For the full zoning text related to the public plaza design standards please read Article III Chapter 7 Section 70 of the New York City Zoning Resolution. To ensure spaces of adequate size are provided to serve the public and accommodate the required amenities, the minimum area for public plazas is 2,000 square feet. This minimum size is adequate for small, vest-pocket parks and can comfortably accommodate seating, planting, and other required amenities. Non-bonused open areas not located adjacent to the sidewalk require a buffer between such area and the plaza. Public plazas should generally be regular in shape (i.e., rectangular, square, etc). However, to allow articulation of building facades facing onto plaza and flexibility in landscape design, the plaza regulations allow for small areas of the plaza to take the form of alcoves or niches adjacent to the main portion of the plaza. If so designed, the main portion of the plaza is termed the “major portion” of the public plaza and must account for at least 75% of the plaza area. The smaller areas are then considered to be “minor portions” and are limited to no more than 25% of the plaza area. Major and minor portions of the public plaza are generally be held to the same design standards, although major portions are be required to meet stricter requirements related to dimensions and visibility, as described below. Major portions of public plazas are required to have average width and depth of 40 feet. To allow for additional flexibility in the configuration and design of the public plaza, up to 20% of the plaza area may be less than 40 feet in depth. In recognition of the importance of continuous street walls in creating an enjoyable pedestrian realm, public plazas may not be located within 175 feet, measured along the street line, of other plazas or parks. For new public plazas that are proposed to be located across the street from an existing public open area, a waiver of the locational restrictions would be allowed by the Chairperson during certification if the Chairperson finds that such proposed location would facilitate and contribute toward greater pedestrian circulation between the proposed space and an existing public open area. To provide both sunny and shaded areas in a POPS and to foster success of plantings, south-facing plazas are generally preferred, unless particular lot configurations prevent such orientation. Where lots do not have south-facing portions or where the south-facing portions are less than 40 feet in width, the plaza is permitted to face either east or west. In no cases are plazas permitted to be only north-facing. Visibility into and throughout the public plaza is of paramount importance in promoting a sense of openness and safety. Consequently, public plazas are required to be completely visible when viewed from any adjacent street frontage. However, to maintain design flexibility for certain public plazas that are located on corners where streets do not meet at 90 degree angles, the visibility requirements only require complete visibility from one street frontage and at least 50% visibility from the other street frontage, as shown in the diagram below. As described above, the regulations permit variation from standards related to dimensions and visibility for up to 25% of the public plaza area, referred to as the minor portion of the public plaza. Such minor portions provide additional flexibility in building and plaza design, such as chamfered corners and small recesses, which enhance the attractiveness, openness, and variation of public plazas. Minor portions are permitted to be smaller and less fully visible than the major portion of the public plaza, provided that the minor portions are directly adjacent to the major portion, are not less than 15 feet in width and depth, and are fully visible when viewed from the major portion. To ensure that minor portions not located on the street frontage are well-integrated with the major portion and provide valuable additional plaza area, such areas are required to have a width to depth ratio of at least 3:1 and to have their longest dimension oriented along the edge of the major portion, as illustrated in the diagram below. Through block public plazas are those spaces located on a midblock that connect two street frontages. Such public plazas are required to contain at least one circulation path at least 10 feet in width connecting the two streets. The circulation path need not be straight and may contain amenities such as trees planted flush-to-grade and light stanchions. In addition, portions of adjoining buildings that front on the public plaza for more than 120 feet are required to set back from the public plaza at least 10 feet at a height between 60 and 90 feet. This requirement ensures that through block public plazas are not located between inordinately tall sheer building walls and to allow a greater sense of openness and human scale within the space. Review of existing plazas has demonstrated that plaza usability is significant determined by the relationship between the sidewalk and plaza. To facilitate access into public plazas from adjacent streets and to enliven the areas where public plazas meet the sidewalk, there are certain regulations applicable to the area within the first 15 feet of a public plaza called the “sidewalk frontage”. The sidewalk frontage of a public plaza is required to have a minimum 50% of its area free of obstructions. In addition, plazas that front on a street intersection are required to maintain a clear area within 15 feet of the intersection. The remaining 50% of the sidewalk frontage may contain obstructions such as fixed and moveable seating, plantings and trees, light stanchions, public space signage, trash receptacles or other design elements that are permitted within public plazas and are under two feet in height. The 2009 text amendment clarified that the clear, unobstructed area is measured perpendicular to the street line and that other amenities such as planting walls and water features are permitted to be greater than two feet in height, as long as such amenities are within three feet of a plaza wall. Plazas with dramatic differences in elevation between sidewalks and plazas lessen their usability, attractiveness, and perception of safety. The regulations now require that public plazas should generally be located at the same level of adjoining sidewalks and streets. Minor changes in elevation, not to exceed 2 feet above the level of the adjacent sidewalk, are permitted. To permit additional flexibility in the design of large public plazas, a maximum of 20% of public plazas greater than 10,000 square feet in size, may be permitted to have an elevation up to 4 feet above the level of the adjacent sidewalk, provided that such elevated area is located more than 25 feet from the sidewalk (street) line. Plazas may generally not be sunken below street level; however plazas fronting on steeply sloping streets – between 2.5% and 5.0% grade change along the length of the plaza – are accorded additional flexibility in accommodating elevation changes and may have an elevation up to 1 foot below the level of the adjacent sidewalk. Minimum and maximum step dimensions are specified to ensure that changes in elevation are comfortable, safe, and appropriate to a plaza setting. Steps are permitted to have heights between 4 and 6 inches. Step treads are required to be at least 17 inches in width, except that 5 inch steps are permitted to have treads at least 15 inches in width. To ensure sufficient accessibility into and within public plazas, circulation paths are required that are at least 8 feet in width and extend to at least 80% of the depth of the plaza. Circulation paths are required to connect each of the street frontages on which the plaza fronts as well as all plaza and building entrances and major design features of the public plaza, including seating areas and open air cafés. Trees planted flush-to-grade, light stanchions, public space signage, and trash receptacles are permitted within circulation paths. Public plazas are generally required to be open to the sky and unobstructed, except for certain permitted obstructions such as planting, seating, and other plaza amenities. Maximum extent of obstruction: Plazas less than 10,000 square feet have a maximum obstruction of 40% of the plaza area. Plazas greater than 10,000 square feet have a maximum obstruction limit of 50% of the plaza area. To compensate for café-related amenities such as seating and tables, plazas with permitted open air cafés are allowed an additional 10% of the plaza area in obstructions. While elevated planters are typically considered obstructions for the purpose of calculating the amount of obstructed area in a public plaza, lawns or grassy areas do not count as obstructions, provided that they are intended for public access and do not exceed 6 inches in height above surrounding walking areas. Canopies, awnings, and marquees: Canopies, awnings and marquees associated with building and retail entrances can enhance the use of a public plaza by building tenants and retail customers in inclement weather conditions. However, these obstructions, if not carefully designed, can dramatically impair the sense of openness and public nature of the plaza area. Canopies, marquees, and awnings are limited to a maximum area of 250 square feet and to a maximum 15-foot projection from the building façade. Such canopies are required to be located at least 15 feet above the surface of the plaza and vertical supports are prohibited. However, canopies associated with the entrances to residential buildings are permitted to project further than 15 feet and have vertical supports if the canopy is located entirely within 10 feet of the edge of the plaza. This allows for comfortable automobile drop-offs or taxi pick-ups for residential tenants, for example, without significantly impacting the larger plaza area. Prohibitions: Certain obstructions are generally prohibited from all public plazas due to their detrimental impact on usability and enjoyment of the public space. Garage entrances, driveways, parking spaces, loading berths, exhaust vents, mechanical equipment, and building trash storage facilities are prohibited within all public plazas. Any such uses located adjacent to a public plaza are required to be screened or concealed from view. In addition, vents and mechanical equipment are prohibited on any adjacent building walls within 15 feet of the level of the public plaza. Air intake vents and intake shafts, such as those to serve underground facilities, are permitted within public plazas if they are incorporated into plaza design features and do not impair visibility within the plaza. Amount and Location: Plazas must provide at least one linear foot of seating for every 30 square feet of plaza. Seating should be easily accessible and located thoughtfully throughout the plaza. To enliven the sidewalk edge and invite passersby to enter and enjoy the plaza, our standards require a portion of the required seating to be located within 15 feet of the sidewalk – a minimum of one linear foot of seating for every two linear feet of public plaza street frontage. To ensure that this seating is comfortable and engages the public by being oriented toward the street, 50% of such seating is required to have backs, and 50% of the seats with backs are required to face the sidewalk. Variety: To accommodate small groups socializing as well as individuals engaged in solitary activities, all public plazas are required to provide at least two different seating types. Plazas between 5,000 and 10,000 square feet are required to provide three types. Plazas greater than 10,000 square feet are required to provide moveable seating as one of the three required seating types. There are six types of seating that may be used to satisfy the seating requirements: moveable seating, fixed individual seats, fixed benches, seat walls, planter ledges, and seating steps. Social seating – seats that are located in close proximity to one another and in configurations that facilitate social interaction – are a basic seating arrangement that should be provided across all seating types wherever possible. Movable tables and chairs are the most flexible form of social seating, however angled and curved benches and groupings of fixed seats can achieve the same purpose. A substantial proportion of seats in a plaza should have backs to facilitate comfort and usability by people of all ages and abilities. To ensure sufficient variety in seating types in the public plaza, seating steps and walls are limited to no more than 15% of the total required seating in the public plaza. Dimensions: Seating that is too narrow, too high, or too short inhibits the usability of a space and runs counter to the goal of providing an enjoyable and comfortable space for a variety of users. Seats are required to be at least 18 inches deep and between 16 and 20 inches in height. To allow for generous plantings, seating provided on planter ledges are required to be at least 22 inches deep. Seating steps can provide flexible seating – from simple perches to generous, amphitheater-style seating -- and are permitted to range between six and 20 inches in height. Prohibitions: Deterrents to seating, such as spikes, rails, or deliberately uncomfortable materials or shapes, placed on any surfaces, required or otherwise, that would otherwise be suitable for seating are prohibited within public plazas. Devices incorporated into seating that are intended to prevent damage caused by skateboards and rollerblades are generally permitted. Such deterrents are required to be spaced at least 5 feet apart from one another, be constructed of high-quality materials that are integrated with the seating design, and should not inhibit seating. Trees and other planted areas are essential components of successful and enjoyable public spaces, providing comfort, shade, and textual variety. A balance should be struck between abundant, lush, and generous planting and the need for adequate sun and openness in the public plaza. Planting: To encourage greater landscaping variety and to prevent plazas from being excessively hard-surfaced, public plazas are required to be comprised of at least 20% planted areas, in the form of planting beds, groundcover or accessible lawns. Plantings in hanging containers do not count as required plantings. To ensure visibility throughout the space, bounding walls for planters or planting beds cannot exceed 18 inches in height, and lawns and turf grass cannot exceed 6 inches in height. Trees within plaza: A minimum of four trees are required within every public plaza. At time of planting, trees must measure at least four inches in caliper or are multi-stemmed equivalents. For plazas greater than 6,000 square feet in area, an additional four caliper inches for every 1,000 square feet of plaza is required. The use of caliper inches, rather than an absolute number of additional trees, allows for additional flexibility in planting design. The requirement can be met by either providing fewer trees with larger diameter trunks or a greater number of smaller, multi-stemmed species. At least 50% of required trees should be planted either flush-to-grade or within at-grade planting beds. When planted flush-to-grade, the trees must be surrounded by a porous surface at least 5 feet in width that allows water to penetrate to the tree roots while at the same time accommodating pedestrian circulation. Trees provided in planting beds are required to have a minimum of 5 feet square of porous area, such as mulch, pebbles, or planted area to allow for water penetration. Trees on sidewalk: Trees are required to be planted in the public sidewalk adjacent to a zoning lot that contains bonus floor area in accordance with the Street Tree Requirements of Zoning Resolution Section 26-41. If the Department of Parks and Recreation determines that the tree planting requirements are infeasible, the number of required street trees that cannot be planted shall be planted in accordance with the off-site tree provisions set forth in Section 26-41 or within the public plaza. Soil depth: To ensure livelihood of planting and trees, appropriate soil depths must be provided landscaping – at least 18 inches for grass or ground cover; 3 feet for shrubs; and 3 feet, 6 inches for trees. Irrigation and drainage: To help landscaping to successfully establish and grow in a challenging urban environment, irrigation is required for all planted areas unless drought-resistant species are specified in the planting plans. Drainage systems are also required in planted areas located above subsurface structures such as garages or cellars. Abundant and well-designed lighting makes a plaza feel safe and inviting 24-hours a day. Light levels should be fairly uniform and be maintained at adequate levels for the use of the plaza. A minimum of 2 horizontal foot candles is required for all walkable and seating areas in the plaza and sidewalks adjacent to the public plaza, and a minimum of 0.5 horizontal foot candles for all other areas. The minimum hours of illumination are from at least one hour before sunset to one hour after sunrise. This requirement applies to all plazas, regardless of whether the plaza has been permitted to close at night. All light sources mounted on or within buildings that illuminate the public plaza must be shielded from direct view. This prevents direct floodlighting of the plaza area, which can impair visibility and compromise the sense of safety. In addition, all lighting within the public plaza must be shielded to avoid impacts on nearby residential units. A well-lit plaza provides a sense of safety, and in addition, thoughtful lighting design can create unique experiences. Litter receptacles must be of sufficient size and quantity to accommodate typical plaza uses, such as lunchtime crowds in a Midtown plaza. One receptacle is required for every 1,500 square feet of plaza. Plazas greater than 6,000 square feet are required to provide an additional one receptacle for every additional 2,000 square feet of plaza. Plazas containing food service, such as open air cafés, are required to provide an additional receptacle for every 1,500 square feet of eating area. All receptacles must have a minimum capacity of 25 gallons and a minimum opening of 12 inches. To ensure that litter receptacles are located so as to adequately serve users of the plaza, all required seating areas must have a litter receptacle within 50 feet. As of April 2009, the zoning requires all new development to provide bicycle parking, including new buildings that utilize the public plaza bonus. However, bicycle parking can also serve plaza users that stop for lunch at an open air café, shop at adjacent retail, or who simply need a rest. All public plazas must provide parking for at least two bicycles, and plazas greater than 10,000 square feet in size must provide parking for at least four bicycles. To ensure that bicycle parking is readily accessible and well-used, bicycle parking is required to be located on the sidewalk adjacent to the public plaza. The New York City Department of Transportation has established standards for the placement of bicycle racks in the public sidewalk and evaluates all requests pursuant to this provision. The bicycle parking requirement may be waived if the Department of Transportation finds that its standards for placement of bicycle racks cannot be met. The provision of clear, visible, and readable signage is essential to identify plazas as public spaces, to provide a list of required amenities provided within the plaza, and to identify hours of access and those responsible for the upkeep and maintenance of the plaza space. Design regulations: The public plaza regulations include standard design guidelines for fonts, colors, and materials for all required public plaza signage. All required plaza signage must be constructed of highly durable materials such as metal or stone that are fully opaque and non-reflective. In addition, all text is required to be highly contrasting with the background color of the sign, at least three-quarters of an inch in height, and in a bold, non-narrow, and sans-serif font such as Verdana, Helvetica, or Arial. The privately owned public space logo, a stylized tree on a gridded background, has been misrepresented and depicted incorrectly in existing plazas. The use of the digital POPS logo file in Adobe Illustrator format (recommended) or pdf format in its original, unaltered form, is now required for all public space signage. The logo is required to be dark green or black in color and placed over a highly contrasting background color or material. Entry plaque: The entry plaque is the primary plaza sign that identifies the space as public and part of the City’s privately owned public space system. One entry plaque is required for every 40 linear feet of street frontage of the public plaza. The plaque is required to be located within five feet of the public sidewalk. The plaque must contain the text “Open to public”, the International Symbol for Access, and “Open 24 hours” or the approved hours of access if a closing has been authorized. Informational plaque: The informational plaque is a critical tool in communicating the required amenities provided within the plaza, the entity responsible for plaza maintenance, and information on how to ask a question or file a complaint about a public plaza. Information plaques are required to be located within five feet of a public sidewalk and at least three feet above the level of the plaza in order to be visible and legible to passersby. The information plaque can be provided either as part of the entry plaque or separately on a wall or permanent free-standing post. Free-standing posts have a maximum height of such element to six feet and a maximum width and depth of 16 inches, to be clearly visible without encumbering views into the plaza. To identify the plaque as part of the plaza signage, the public space logo must be included. The information plaque is required to state the hours of operation of the plaza, the amount of required amenities, the name and contact information for the plaza owner, and direction to call 311 in the case of questions or complaints. Hours of access plaque: In cases where limitations on the hours of access into the public plaza have been approved by the City Planning Commission and barriers have been placed in the public plaza area to limit access, small plaques are required to be affixed to the barrier. These plaques provide information to the public about when the plaza can be closed. The plaque must contain the public space logo at two inches square and list the hours of operation of the plaza. See the Hours of Access / Nighttime Closing for more information regarding nighttime closing of public plazas. Prohibition signs: A maximum of one prohibition sign that lists prohibited items and activities is allowed, provided that the sign is not greater than one square foot in area and does not prohibit a normal plaza activity (such as lingering or eating) or anything that is illegal or prohibited by existing laws. Accessory signs: Signage accessory to a building or tenants of a building associated with a public plaza can add a sense of identity to a plaza, as well as ensuring that the quality and upkeep of the plaza are tied to the identity of the tenant. Each establishment fronting on the plaza is allowed one accessory sign located on the building wall, and such sign cannot exceed four square feet. The content of all accessory signs are limited to the building or tenant name and address. No sign in a public plaza may be illuminated. A maximum of one accessory sign is permitted to be freestanding and must include the public space logo as well as the words “Open to public”. The freestanding sign cannot exceed two square feet in size, and cannot be located higher than three feet. Accessory signage located on permitted canopies or awnings is limited to one foot in height. Plazas that exceed 5,000 square feet are required to provide amenities in addition to those described above. This requirement acknowledges that larger plazas can and should accommodate a more varied palette of design features. The additional amenities are: artwork; moveable tables and chairs; water features, such as fountains or reflecting pools; children’s play areas; game tables and seating; and food service, such as open air cafés, kiosks, or food service in adjacent retail spaces. Plazas between 5,000 and 10,000 square feet are required to provide at least one of the additional amenities and plazas greater than 10,000 square feet must provide three. Plazas greater than 10,000 square feet in area and associated with a commercial building must provide food service as one of the three required additional amenities. By default, all privately owned public plazas are open to the public 24 hours throughout the year. Nighttime closing of public plazas is only permitted via City Planning Commission authorization. Barriers: Barriers should not impede access into the plaza during hours of public operation. When closed, such barriers are permitted to be up to five feet in height, provided that the barriers are fully removed from the plaza area during opening hours. If the barrier is limited to no more than three feet six inches in height, posts or supports less than six inches in width are permitted to remain within the plaza area during hours of operation. Stanchions or cabinets for barrier storage are not permitted within the plaza area. Barriers not to exceed 3 feet 6 inches in height may have posts that remain during hours of public access provided that they do not exceed 6 inches in diameter. To ensure that plazas are accessible and enjoyable for all users regardless of ability, compliance with applicable building code standards for access for persons with disabilities is required for all public plazas. 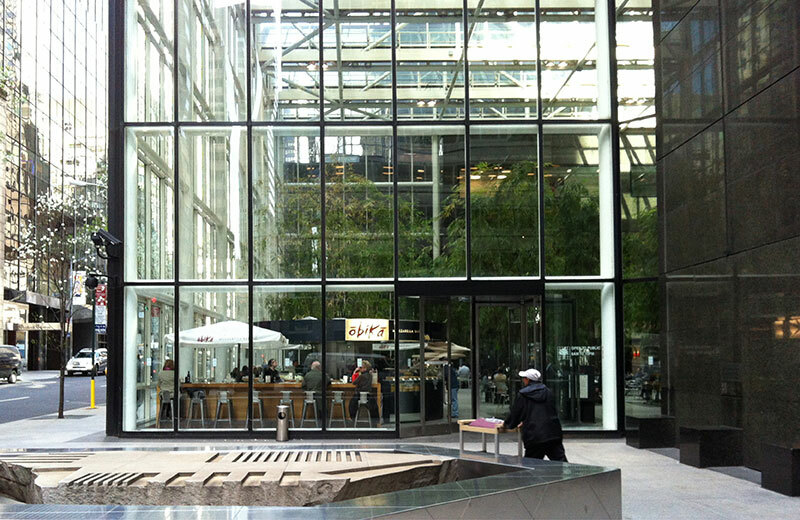 Kiosks and open air cafes can provide valuable food service amenities to users of public plazas. To ensure that such amenities are well-designed and integrated into the plaza layout, cafes and kiosks are permitted only through certification by the Chairperson of the City Planning Commission that the café or kiosk complies with operational and design standards. The following standards would apply to all public plazas and all 1961 plazas, urban plazas or residential plazas existing prior to 2007 (pre-2007 plazas). Kiosks: One 100-square foot kiosk is permitted for every 5,000 square feet of plaza and such kiosks must not impede circulation into or within the public plaza. Permitted uses of kiosks include book or news stands, food or drink service, and other uses that complement the use of the public plaza. All kiosks are required to provide service at least 225 days per year, unless the kiosk is fully removed from the public plaza when not in operation. Open air cafés: Cafes must be unenclosed and open to the sky except for umbrellas, temporary fabric roofs with no vertical supports, and heating lamps. Cafés may not occupy more than one-third of the street frontage of the plaza and, except for plazas greater than 30,000 square feet, cafes must be located against one edge of the plaza. To ensure that open air cafés do not adversely obstruct access into and throughout the public plaza and that such uses complement the public nature of the plaza, the use of fences, planters, or other dividers to separate the café from the plaza is prohibited. Recognizing that the placement of a café in a pre-2007 plazas may be constrained, to some extent, by the design requirements existing at the time such plazas was built, the 2009 text amendment requires open air cafes to be accessible from all sides, but allows cafes to located adjacent to a planter or wall that was part of a plaza prior to the approval of an open air cafe. With regard to the elevation of cafes, cafés are required to be located at the same elevation as the plaza, except for platforms that do not exceed 6 inches in height. The 2009 amended text does not subject the grade change regulations to new cafes in pre-2007 plazas, acknowledging the design regulations which may have existed when the plaza was approved. All cafés must provide service at least 225 days per year and, when not in operation, all equipment, except for tables and chairs, must be removed from the plaza. The vibrancy and vitality of a plaza is directly related to the uses in buildings directly adjacent to the space. Active uses with visual transparency activate and enliven a plaza by providing physical and visual amenities for plaza users. Conversely, blank and opaque walls, if not properly treated, can deaden a space. Retail and services: At least 50% of a building’s frontage on a public plaza must be occupied by retail or service establishments allowed under the applicable underlying zoning district. These uses may include neighborhood retail uses such as restaurants, supermarkets and clothing stores. Certain uses that are incompatible with the goal of providing active, enlivening establishments adjacent to the public plaza are prohibited, including offices, wholesale establishments, automobile servicing and showrooms, public parking garages and lots, certain manufacturing establishments, banks, and plumbing, heating, and ventilating equipment showrooms. To ensure that valuable retail spaces are provided, each such establishment is required to be at least 15 feet in depth. Building entrances: Some of the most successful and well-maintained spaces are those that have principal building entrances located on or very near to the plaza. Such spaces, by being directly linked to a building’s identity and tenants, become a "front porch" for the building and are well-utilized and looked after as if part of the building itself. To ensure that this connection between building and plaza identity is maintained, principal building entrances are required be located on the plaza itself or within 10 feet of the plaza. The intent of this regulation was further clarified in the 2009 text to make clear that such a building entrance is one that provides access to the principal use of the building, prohibiting certain building entrances from fronting on the plaza. Transparency: In addition to the building entrances, visual connection through transparent building walls also help link the building to the outdoor space and also improve activation and sense of safety. Thus, all new building walls fronting onto a public plaza must be treated with clear, untinted transparent material at least 50% of the surface area below 14 feet above the plaza level or the ceiling level of the ground floor, whichever is lower. Any non-transparent area of a new or existing building wall must be treated with a decorative element or material, or screened with planting to a minimum height of 15 feet above the plaza level.